I feel safer on a racetrack than I do on Houston’s freeways. I’m nowhere as tough as my father. I really think that I am more open to change than he was. 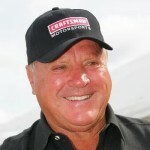 Foyt was born in Houston, Texas. He attended Pershing and Hamilton middle schools and Lamar and San Jacinto high schools, but he dropped out to become a mechanic. He started his USAC career in a midget car at the 1956 Night before the 500 in Anderson, Indiana. His first midget car win was at a 100 lap event at Kansas City in 1957, and finished seventh in the season points standings. He left midget cars after the 1957 season to drive in sprint cars and Championship Car. He did occasionally compete in midget car events. He won the 1960 and 1961 Turkey Night Grand Prix, the first two years that it was held at Ascot Park. He won the 1961 Hut Hundred after starting last, and finished seventh in National Midget points that year. He won the 1970 Astro Grand Prix, an event that he promoted in his hometown of Houston. He ended his career with 20 midget car feature wins. He raced in each season from 1957–1992, starting in 374 races and finishing in the top ten 201 times, with 67 victories. In 1958, Foyt raced in Italy in the Trophy of the Two Worlds on the banking at Monza. Also, in 1964 Foyt won a record 10 of 14 races enroute to his championship.